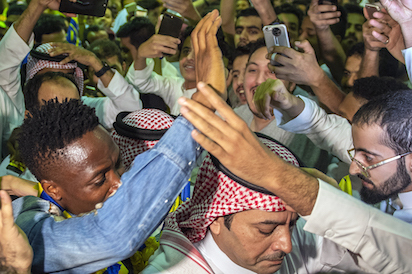 Saudi Arabian football club, Al-Nassr supporters gave rousing welcome to Ahmed Musa , the eighth best scorer at the Russia 2018 World Cup, who secured his anticipated transfer from Leicester City to Al-Nassr recently. 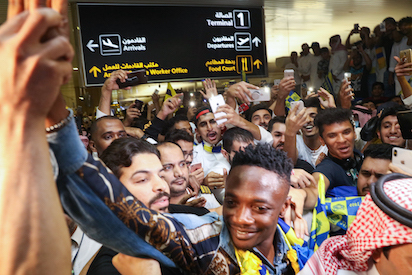 Photos showed Al-Nassr supporters waving the club flags on Friday as they gathered to welcome Nigerian forward Ahmed Musa upon his arrival at King Khalid International Airport in the Saudi capital Riyadh early. Nigeria forward, Ahmed Musa left Premier League side Leicester for the Saudi Professional League (SPL) side Al-Nassr, the Saudi Arabian club announced on August 3. 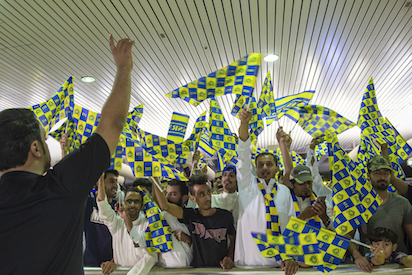 Al Nassr had earlier announced the signing of the international Moroccan football player Noureddine Lamrabet who played at the English Premier League for Watford.